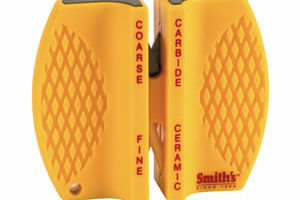 Smith’s 3-in-1 Sharpener can handle all of your sharpening needs. 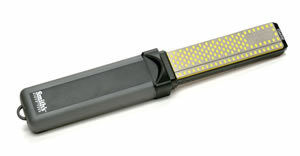 It features pre-aligned carbide blades, which are reversible and replaceable, for quick edge setting capabilities. 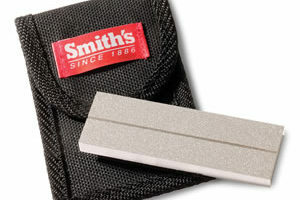 The Fine 750-grit Interrupted Surface Diamond Stone provides a quick razor sharp edge on any knife or tool. 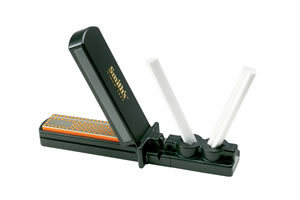 A pair of specially shaped teardrop ceramic rods provide multi-use sharpening capabilities, everything from standard to serrated edges along with hooks and tools. 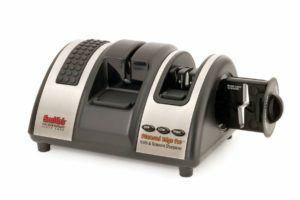 The protective storage lid also serves as a hand guard, and the ceramic rods fit securely into a compartment in the bottom of the base for safe and easy storage.